Tulsa is the second-largest city in the state of Oklahoma. It has many diverse neighborhoods due to its size. The city's historical residential core lies in an area known as Midtown, containing upscale neighborhoods built in the early 20th century with architecture ranging from art deco to Greek Revival. The University of Tulsa, the Swan Lake neighborhood, Philbrook Museum, and the upscale shopping districts of Utica Square, Cherry Street, and Brookside are located in this region. A large portion of the city's southern half has developed since the 1970s, containing low density housing and retail developments. This region, marked by secluded homes and suburban neighborhoods, contains one of the state's largest shopping malls, Woodland Hills Mall, as well as Southern Hills Country Club, and Oral Roberts University. East of Highway 169 and north of 61st street, a diverse racial makeup marks the eastern portions of the city, with large Asian and Mexican communities and much of the city's manufacturing industry. 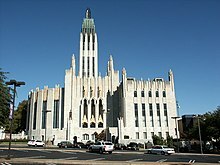 Tulsa includes many structures built during the Oil Boom in the 1920s and 1930s, including Art Deco buildings such as Boston Avenue Methodist Church and Tulsa Union Depot. Waite Phillips left a significant architectural impact on downtown Tulsa through the Philtower and Philcade Building. Other notable downtown Tulsa buildings include the Exchange Bank Building (today known as the 320 South Boston Building, the Cosden Building (later expanded into today's Mid-Continent Tower), Atlas Life Building, Holy Family Cathedral, Holy Trinity Greek Orthodox Church, and the Mayo Hotel. Known for a time as "Terra Cotta City", Tulsa hosted the International Sixth Congress on Art Deco in 2001. The core downtown area was designated on the National Register of Historic Places as the Oil Capital Historic District in 2010. Downtown Tulsa is in the northwest quadrant of the city and is ringed by an expressway called the Inner Dispersal Loop. Downtown's buildings include many large office towers. At 667 ft (203 m), the BOK Tower (formerly One Williams Center) was the tallest building in any of the 5 "plains states" (Oklahoma, Kansas, Nebraska, North Dakota and South Dakota) until the Devon Tower in Oklahoma City was completed in 2012. The BOK Tower was designed in 1975 by Minoru Yamasaki & Associates, the same architect who designed the World Trade Center in New York City. The Tulsa Performing Arts Center occupies a half city block in Tulsa's historical downtown. The PAC is also the design of Minoru Yamasaki. It houses five theatres and a reception hall. More than a quarter of a million people visit the Center each year to attend a performance from one of Tulsa's seven acclaimed musical and dramatic companies including the Tulsa Ballet, Tulsa Symphony Orchestra, Tulsa Opera, Theatre Tulsa, and a variety of symphonic groups. The PAC hosts a multitude of cultural events through the fall, winter and spring. In 2005 the City of Tulsa broke ground on a 19,199 seat regional events center designed by architect César Pelli. The arena was named the BOK Center (or Bank of Oklahoma Center) and opened on August 30, 2008. The Blue Dome, a former Gulf Oil Service Station, built in 1924. Another popular downtown entertainment district is the Blue Dome, named for a distinctive, domed building at Second Street and Elgin Avenue, in the area in the eastern section of downtown. The building was originally constructed in 1924 as a Gulf Oil service station. It has been converted to an information desk/office for the district, and is about two blocks south of the OneOK field. East Village comprises 115 acres bordered by East 2nd and East 7th Streets, Detroit Avenue and Lansing Avenue, just inside the inner-dispersal loop. This area boasts an upscale martini bar, American Theatre Company Studios, a hair salon, a pet day care, photography studios, lofts, a knitting room and living arts district, among others. The cornerstone of this neighborhood is now the second largest LGBT community center in Oklahoma, the Dennis R. Neill Equality Center, owned and operated by Oklahomans for Equality/OkEq (formerly Tulsa Oklahomans for Human Rights/TOHR), with further development being planned for more restaurants, residential lofts and retail. The Oil Capital Historic District was added to the National Register of Historic Places in 2010. It is bounded by Third Street on the north, Seventh Street on the South, Cincinnati Avenue on the east and Cheyenne Avenue on the west. This area contains many of the historic Downtown office buildings constructed during the 1920s and 1930s. Riverview stretches along the east bank of the Arkansas River, just west of Downtown. Uptown is the region just to the south of Downtown. The SoBo (South Boston) bar district in this area at 18th and south Boston is quite popular. The Ambassador Hotel, now listed on the National Register of Historic Places listings in Tulsa County, Oklahoma, was built in 1929 to provide temporary housing for businessmen and now functions as a boutique hotel. The building is at the corner of Main and 14th Street. The Tulsa Preservation Commission identified this location as "...the Southeast Business Area of the Riverview section of Tulsa." The Buena Vista Park residential addition, consisting of three blocks, was begun in 1908. It was the start of what is now Buena Vista Park Historic District, which was listed on the U.S. National Register of Historic Places (NRHP) in 2007. The district now covers 5 acres (2.0 ha). Its period of architectural significance was 1913 - 1933. One of the supporting properties, the James Alexander Veasey House at 1802 South Cheyenne Avenue West, was added to the NRHP in its own right on July 27, 1989. The Pearl District is emerging as a cultural hub just east of downtown. Once suffering from significant blight, The Pearl District has seen fervent restoration and new business development thanks to a concerted infill effort on the part of the City of Tulsa, including new bars and restaurants, white collar small offices and new residential buildings, with zoning designed to encourage mixed use and walkability. It is bordered by 1st street to the north and 11th street on the south, and lies adjacent to Centennial Park to the west. The Tulsa Fire Alarm Building at 1010 South Detroit, which has been unused for several years, is part of this district. The building was sold in July 2015. It will be converted into a museum honoring Tulsa's firefighters. The museum is expected to open in late 2015 or 2016. The Pearl District also contains The Church Studio, a former church that Leon Russell turned into a recording studio and the focal point of the Tulsa Sound music movement during the 1970s. Riverview is bounded on the north by 12th and 13th Streets, on the east by the alley between Denver and Elwood Avenues, on the south by Riverside Drive and 14th Place, and on the west by Jackson Avenue. The name came from Riverview Elementary School, which was at 12th and Guthrie. Although the school building was demolished in 1975, the district retained its name.This area contains houses and apartment buildings constructed between 1911 and 1938. Included are several structures that are individually listed on the National Register of Historic Places. Midtown is a largely residential district in the heart of the city. This area consists mostly of homes built from the early 1900s to the 1950s and has a wide variety of American styles ranging from the Craftsman bungalow to the ranch-style home to Greek Revival. The neighborhood is even home to a relocated saltbox home from colonial New England. Schools in this part of the city include Bishop Kelley, Edison Preparatory School, Eliot Elementary, Francis Scott Key Elementary, Monte Cassino, Robert E. Lee Elementary, Patrick Henry Elementary, Wright Elementary and Undercroft Montessori. Woodward Park, located in Midtown, is known for its azaleas and gardens and is a popular destination for photography and picnics. Other popular Midtown Parks include Swan Lake, Zink Park, Darlington Park and Whiteside Park. Utica Square, Tulsa's first suburban shopping center, is an upscale outdoor center with a mix of locally owned retailers, including Miss Jackson's, Tulsa's oldest department store, and national chains. Adjacent to Utica Square is Temple Israel, a Reform Jewish congregation housed in a building by prolific synagogue architect Percival Goodman, and Cascia Hall Preparatory School, a college preparatory school now also known as a key location in the fantasy/horror House of Night novel series written by P.C. Cast and Kristin Cast. Tulsa's conservative synagogue, B'nai Emunah, is also located in Midtown. Some of the other major shopping centers in this part of the city include the Promenade Mall, Highland Park Shopping Center, Southroads, Ranch Acres, The Farm Shopping Center, and The Plaza. OU-Tulsa is across the street from the Promenade Mall at 41st and Yale, on the southern edge of Midtown. In northeast Midtown, the Tulsa State Fairgrounds, now called Expo Square, is home to several Tulsa landmarks. In addition to the site being the former home to the minor league baseball Tulsa Drillers, the Art Deco Expo Square Pavilion, the Fair Meadows horse racing track, and the annual Tulsa State Fair, it boasts the Quick Trip Expo Center, the largest clearspan building in the world, providing 354,000 square feet (33,000 m²) of column-free space under a cable-suspended roof. In front of the Expo Center is the Golden Driller, standing 76 feet (23 m) tall. Built in 1966 as a symbol for the International Petroleum Expo, the statue serves as a reminder of Tulsa's oily past. The Expo Center is also home to the annual Darryl Starbird Rod and Custom Show. Held in early February, it is touted as 'The World's Largest Indoor Car Show' and often draws around 1,500 custom and classic cars, trucks, and motorcycles. Antique car auctions are also held here and draw many visitors from across the nation. The Tulsa area boasts nearly 40 miles (64 km) of river shoreline along the Arkansas River. River Parks lines more than 20 miles (32 km) of that stretch, spread along both banks of the 1/4 mile wide channel and connected by a pedestrian bridge between 21st and 31st streets. River Parks is a popular destination for outdoor recreation. Miles of asphalt-surfaced recreation trails weave past picnic areas, playgrounds, fountains and sculptures. The park's landscape ranges from manicured lawns to the rugged terrain of the Turkey Mountain Urban Wilderness Area. Recreation in River Parks includes fishing, rowing, kayaking, disc golf, hiking, biking and horseback riding. During the spring, summer, and early fall, concerts, festivals and the state's largest free fireworks display (on the Fourth of July) are popular draws to the river. The festival park on the river's west bank is the site of Tulsa's Oktoberfest, one of the oldest and largest in the U.S. The Cherry Street District is set near downtown in the northern midtown area, defined by a portion of 15th Street dubbed "Cherry Street." 15th Street has been a major east-west thoroughfare in Tulsa since This street was named Cherry Street prior to the early 1900s, when a city ordinance mandated a numerical street name. The eastern and western boundaries of the present-day district are rather vaguely defined in common usage. A 1992 article in the Tulsa World stated that the district extends from Peoria Avenue on the west to Utica Avenue on the east. The northern and southern boundaries of this informal district are apparently undefined. South Quaker Avenue intersects Cherry Street one block east of Peoria. The 1400 block of South Quaker contains five houses of historical interest because they represent the style of homes constructed during the very early 1920s. The most notable is known as McGregor House at 1401 South Quaker, at the intersection of Quaker and 14th street. It is a 1-1/2 story Prairie Style house designed about 1920 by Bruce Goff, then a 15-year-old apprentice with the Rush, Endacott and Rush architecture firm. The house was listed on the National Register of Historic Places (NRHP) under Criterion C - Architecture, with registration number 10001011. Visitors to this neighborhood can find many local restaurants, boutique shops, art galleries, antique shops, funky vintage stores, and even a scooter shop now filling old storefronts built in the 1920s & 1930s, as well as some notable old homes in the surrounding residential areas. Numerous condos have been built in recent years just north of Cherry Street. Cherry Street is surrounded by four of Tulsa's designated Historic Districts: the Swan Lake, North Maple Ridge, Gillette and Yorktown neighborhoods. Other neighborhoods adjacent to Cherry Street are Florence Park, Tulsa and the Renaissance neighborhood. The Maple Ridge Historic District is just south of downtown in Midtown. This neighborhood contains 'Black Gold Row', where mansions built by the oil barons in the 1920s still stand, long after their original owners have gone. Sunset Terrace is located adjacent to Maple Ridge on its South Side, Terwilleger Heights on its East Side and the Arkansas River to the West. It is traversed by the grand Woodward Boulevard, which links Maple Ridge to Brookside. Sunset Terrace contains many mansions built in the 1920' and 1930s. Brookside, like Cherry Street, is another popular shopping and entertainment district in Midtown. This area extends from the Arkansas River east to Lewis Avenue and south to 51st Street/Interstate 44. Its defining strip is South Peoria between 31st and I-44, which is a popular commercial area with various upscale shops, boutiques, and art galleries, as well as 35 restaurants and nightspots (many with patio seating) spanning a wide variety of cuisines and dining styles. Scenic Riverside Drive, which parallels the east bank of the river, and River Parks, the park that stretches along the riverbank, are also popular sections of Brookside. This is a subdivision of modern homes along South Yale Avenue near 26th Street. Based on a master plan by Tulsa architect Donald Honn, the low-pitch roofs and clean lines of the houses typify the style known as Mid-Century Modern, and the neighborhood was the city's first housing development with a community pool. Construction began in 1953 and all Lortondale homes featured central heating and air conditioning—reportedly the first such subdivision in the nation. Recognized as a historic neighborhood, Ranch Acres was added the National Register of Historic Places in 2007. The neighborhood is an excellent example of a post-World War II ranch house subdivision. The area is situated primarily between 31st and 41st Streets along South Harvard. The Patrick Henry Neighborhood was developed during the Fifties and Sixties and situated between Harvard and Yale at 41st Street south I-44. Patrick Henry is made up of ranch-style homes known for their open floorplans and large lots. Many of these homes were featured on the annual Parade of Homes tours that featured new and modern designs. This area takes its name from the two larger neighborhood parks lying within it. The homes in this area are mostly ranch-style homes, some with pronounced mid-century modern design cues. It area overlaps with the Patrick Henry neighborhood, extending East of Yale Avenue to Bishop Kelley High School. Mockingbird Lake is in this neighborhood. Although the neighborhood is primarily residential, it is also home the Tulsa Schusterman campus of University of Oklahoma (including the OU School of Community Medicine) and several commercial developments (most notably Tulsa Promenade). To the east of downtown is Tulsa’s oldest suburban shopping area and is noted for its abundance of red brick. The artsy, historic, and recently restored Circle Cinema is located in this area. The Kendall-Whittier shopping area and surrounding neighborhoods are now popular with Tulsa’s rapidly growing Hispanic community. Just east of this area is the University of Tulsa. Swan Lake is a historic district whose borders consist of 15th Street to the North, Utica Street to the East, 21st Street to the South, and Peoria Avenue to the west. This area was originally named Orcutt District for the landowner, and the lake was originally a cattle watering place. It was the site of an amusement park in the early Twentieth Century, but is now notable for the number and architectural variety of houses and apartment buildings constructed in the 1920s and 1930s. Terwilleger Heights is located immediately south and west of Utica Square bordered by 21st Street, 31st Street, Utica Avenue and Peoria Avenue. This area has early 1930s homes both grand and small, mature and many newly planted trees, winding streets and is adjacent to the Philbrook Museum of Art and Woodward Park, site of the Tulsa Rose Garden. Renaissance neighborhood is between 11th Street (Route 66) and 15th Street and Lewis Avenue on the west to Harvard Avenue on the east with Delaware Avenue cutting through the middle. The University of Tulsa is just north of 11th St. on the east side of Delaware. It's a mix of 1920s bungalows and 1930s revival style houses with houses of other eras mixed in, from very new to a few pre-20s houses that were moved from the site of Central High School (now the PSO HQ) in the mid 20s. Renaissance is also a mix of single family homes and a number of duplexes and the east side of Delaware has housed many TU students over the years. Renaissance has an active neighborhood association. Florence Park & Florence Park South neighborhoods runs from Harvard Avenue on the east, to the Broken Arrow Expressway on the south & west, and stops at 15th Street on the north. There's a particularly good mix of 1920/30s houses, mostly revival styles, and two of midtown Tulsa's first neighborhoods to be re-discovered and appreciated after the 60/70s flight to suburbia. White City is a residential neighborhood in Midtown, Tulsa, Oklahoma. It is bounded on the north by 2nd Street, on the east by Fulton Avenue, on the south by 11th Street and on the west by Yale Avenue. The neighborhood was added to the National Register of Historic Places in 2001. The area includes 480 buildings, of which 325 retain their historic significance. Two parks are also included in the listing. Tulsa's north side originally referred to the area north of the Frisco Railroad tracks up to the northern city limits. It was annexed by the city of Tulsa in 1904. The north side is home to a large percentage of Tulsa's African-American community in addition to working-class Tulsans of other races and ethnicities. The area's Booker T. Washington High School, Tulsa’s African-American high school during the segregation era and now a magnet school, was recently judged to be the 58th best high school in the nation by Newsweek. Northeast of downtown, close to Tulsa International Airport, is Mohawk Park, which includes the Tulsa Zoo and the Oxley Nature Center, and the Tulsa Air and Space Museum. This area is also home to the American Airlines maintenance facility, one of Tulsa's largest employers. The Greenwood Historical District is just north of downtown and east of the Brady District. It was once one of the most affluent African-American communities in the United States and referred to as Black Wall Street. In 1921, thirty-five blocks of businesses and residences were burned in this district during the infamous Tulsa Race Riot, the bloodiest racial riot in the history of the United States. The Oklahoma Legislature passed laws in 2001 aimed at revitalizing Greenwood, setting up a scholarship fund for college-bound descendants of riot victims and appropriating $2 million for a riot memorial. As of 2004, two blocks of the old neighborhood have been restored and are part of the Greenwood Historical District. It is now home to the Greenwood Cultural Center, the Tulsa Race Riot Memorial, and the John Hope Franklin Center for Reconciliation, as well as Oklahoma State University - Tulsa and Langston University-Tulsa. The Brady Arts District is located north across the Sante Fe Railroad tracks from the central business district and centered at Main Street & Brady Avenue. The Brady District is one of Tulsa's oldest areas, characterized by two-story brick warehouses. The Brady Theater, built between 1912 and 1914, was originally designed to serve as the city's municipal auditorium and was simply called "Convention Hall" for the first forty years of its life and was one of three internment camps where African Americans were detained after the 1921 Tulsa Race Riot. In 1952, major additions were added and the building was renamed Tulsa Municipal Theater. The building was listed on the National Register of Historic Places in 1979. Supplanted as the city auditorium in 1979 by construction of the Performing Arts Center in downtown, "the Old Lady on Brady" continues to be used today for a wide variety of concerts and theatrical productions. North of the Brady on Main Street is the Cain's Ballroom, formerly the garage of the Brady family and the home of Bob Wills and his band, the Texas Playboys. The district is also the location of many local artists' galleries, restaurants with late night hours, bars and dance clubs. It is also an emerging gay neighborhood, with several gay or gay-friendly bars and numerous supportive shops and restaurants. Today, The Brady Arts District is one of the most diverse areas in all of Tulsa. It hosts restaurants, clubs, museums, and businesses and is a prime example of urban living. There is presently construction which will more than double the number of permanent residents in this artistic enclave. The neighborhood's renaissance got a significant boost in late 2012 with the opening of Guthrie Green, a public garden and outdoor stage, on a central plot of land formerly inhabited by commercial buildings. Guthrie Green has quickly emerged as a neighborhood focal point, hosting community events, live music and a farmers market. Brady Heights is a historic district in Tulsa, Oklahoma named for early resident, W. Tate Brady. Its boundaries are Marshall Street on the north, the alley between Cheyenne Avenue and Main Street on the east, Fairview Street on the south, and the Osage Expressway right-of-way on the west. From territorial days until the 1920s, Brady Heights was an important part of the then-fashionable north side of Tulsa. Young professional businessmen and oil men, like G. Y. Vandever, I. S. Mincks and “Diamond Joe” Wilson, owned homes there. The North Cheyenne Historic District is bounded on the north by an alley between Archer and Brady Streets, on the east by the alley between Boulder and Cheyenne avenues, on the South by the Frisco railroad tracks and on the west by North Denver Avenue. It was a commercial and industrial area that developed during the early Twentieth Century. According to the Tulsa Preservation Commission, the district "...was added to the National Register of Historic Places on December 13, 2010 under Criterion A for significance in commerce. Its NRIS number is 10001011." The history of the Owen Park neighborhood can be traced to the early 19th Century. A description of the area was given by Washington Irving in his book, Tour of the Prairies. A monument in Tulsa's Owen Park denotes the point where the lands of the Osage, Creek and Cherokee nations met. The first American settler was Chauncey Owen, husband of a Creek woman who qualified for a land allotment. This land later became the Owen Park neighborhood. Its borders are Edison Avenue on the north, the municipal Owen Park on the east, the Keystone Expressway (Hwy 412) on the south, and Zenith Avenue on the west. Owen Park is a rapidly gentrifying historic neighborhood that has historic mansions and Crafstman style homes. It is one of the closest neighborhoods to the Brady District and downtown Tulsa. 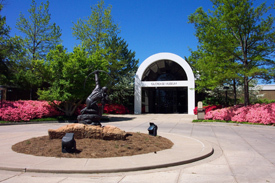 Northwest of downtown on the Osage Indian Reservation is the Gilcrease Museum, considered by many to be the finest Western American and American Indian art collection in the world. Thomas Gilcrease was a member of the Creek nation who became very wealthy after the discovery of oil on his allotment. He invested much of his wealth in art, and opened a gallery on his estate in northwest Tulsa in 1949. He deeded the art collection, building and grounds to the City of Tulsa during the mid-1950s. Sharon Hanson, president of the North Star Neighborhood Association, approached an official in the Mayor's office and money was put in the budget for the 36th street north corridor. The community chose the Phoenix District as the new name. The Phoenix District is the home of the OU Physicians Wayman Tisdale Specialty Clinic. Tulsa's south side is popularly considered to be south of the Skelly Bypass (I-44), bounded on the south by the city of Bixby, on the west by the Arkansas River and the city of Jenks, and on the east by the city of Broken Arrow. Many new luxurious homes have been constructed here in the last few decades, as well as numerous apartments, in various price ranges. Land in the area is becoming scarce, however, and development now has begun to spread to neighboring Jenks and Bixby to the south and west, as well as Broken Arrow to the east. As a more affluent demographic has moved into the area, businesses tailored to such residents have also opened nearby. The city's largest automotive dealer strips are located along S. Memorial Dr. from 91st to 101st Streets and from 51st to 31st Streets. The Riverwalk Crossing Shopping Center, just over the river in Jenks at 96th st. includes a movie theater, fine dining, and shopping. Nearby lies the Oklahoma Aquarium, the only one in the state of Oklahoma. Local freshwater fish are complemented by a fine selection of saltwater animals, including sharks. The Karl and Beverly White National Fishing Tackle Museum has over 20,000 pieces valued at more than $4 million. This exhibit makes up the largest and most comprehensive antique fishing tackle collection in the world. St. Francis Hospital and its surrounding medical practitioner's offices is located at 61st and Yale and is one of the largest in the state. Prominent in that area of town is the upscale Braeswood neighborhood, East 61st to 63rd Streets and Louisville to Oswego Avenues. Another healthcare cluster exists around South 91st and Mingo, including Hillcrest Hospital South, Cancer Treatment Center of America and Saint Francis Hospital South. Woodland Hills Mall, the largest in the state anchors the 71st street corridor. Numerous dining options are available in the area. Additionally, shopping centers surrounding the mall are panoramic in scope, as the options for shopping are seemingly endless. It is in this area that the 4-star John Q. Hammonds Renaissance Hotel is located, including conference and meeting rooms. It is located right off US 169, a major north-south highway in eastern south Tulsa. This road curves to the west at around 96th street and soon turns into the Creek Turnpike, a toll road that has been extended to the west to I-44 and to the east to I-44, nearly forming a semi-circular loop around southern Tulsa and its surrounding suburbs. The schools in the area are some of the state's largest, including Jenks and Union High School, with neighboring Broken Arrow being the largest. Tulsa Public School's Memorial High School is located here, along with prestigious, private Holland Hall. Jenks, and Union High Schools are annually among the best in the state and nation in football and their rivalry has drawn national attention. Tulsa Community College, the largest 2-year school in the state, has its Southeast campus off 81st and US 169. Parks in the area include LaFortune Park, with 2 public golf courses, playgrounds, swimming pool, and jogging trail, Hunter Park, with a disc golf course, jogging trail, playground, and fishing pond, and the Riverparks, which extend south to 101sts St. Some of the largest and most influential churches in the country in Tulsa are in this part of Tulsa, including Victory Christian, Kirk of the Hills Presbyterian, Asbury United Methodist, South Tulsa Baptist and Grace Church. Southeast Tulsa is generally considered as south of 41st St S and east of S Sheridan Rd, all the way to the Bixby and Broken Arrow city limits. Union Schools service most of these residents, with a handful of neighborhoods being served by Tulsa Public Schools and Broken Arrow Public Schools (further east). Neighborhood Parks, soccer fields, sports fields, and public pools can be found within the area. There are multiple corporate offices and other business in the area that staff large work forces. A large diversity of shopping and eating-out opportunities can be found in southeast Tulsa. The area provides easy access to I 244, I 44, Hwy 169 (Mingo Valley Exp), The Creek Turnpike, and the Broken Arrow expressway. Such easy access makes it quick for driving to desired locations and businesses in Downtown, Midtown, Southside, Westside, the Airport, all the major shopping/entertainment areas of the city, and to the outlying cities of Broken Arrow, Owasso, Bixby, and Jenks. The area offers housing built from the early 1970s to the present. The historic and now largely abandoned community of Alsuma, Oklahoma lies in this area. Alsuma was annexed by Tulsa in 1966, and is now listed as a ghost town. Southern Hills is an exclusive neighborhood on the south side that is centered on the Southern Hills Country Club at 61st and Lewis. Southern Hills Country Club has hosted 13 major golf championships including four U.S. Opens. Many of the original homes in this neighborhood are sprawling suburban homes built in the ranch style. Tulsa's east side is a suburban-style area laying roughly east of Sheridan Road, north of 41st St S, and south of Tulsa International Airport. Constructed largely in the 1950s, 1960s, and 1970s, attractions in this part of the city include McClure Park, which is notable for its disc golf course, the Carl Smith Athletic Complex, and the popular Admiral Twin Drive-In movie theatre. There is also a large portion of Route 66 on Tulsa's east side. Areas that fall in Union and Broken Arrow School districts are increasingly attracting high-income professionals looking for suburban life within the city limits. Mayo Demonstration Academy, a magnet school of the Tulsa Public School system, is located in this area. Eastgate Metroplex and East Central High School are also in this area. Also the area is home to Tulsa's Eastern hospitality district, where many hotels are located. East Tulsa is also home to growing Mexican-American and Vietnamese-American populations (the latter centered around St. Joseph Vietnamese Catholic Church). Redbud Valley Nature Preserve is also located in this part of the city. Communities of Tulsa's west side in city limits are Red Fork, Carbondale, Garden City, and Turkey Mountain. Other communities considered a part of the west side, but located in Creek County, are Oakhurst, Oakridge, and Allen-Bowden. West Tulsa is another reminder of Tulsa’s oil-rich past. Two oil refineries remain in operation to this day on the west bank of the river. This large industrial area gives way to wooded and hilly neighborhoods. The classic art deco Webster High School is here, as is the popular train-themed Ollie’s Station Restaurant, sitting next to the Tulsa rail yard. Other schools in West Tulsa include Berryhill High School, Remington Elementary, Robertson Elementary, Park Elementary and Clinton Middle School. Webster is the oldest existing high school facility in Tulsa, and has an active alumni association. Portions of Route 66 pass through west side. The area is broken up into several sections, including Carbondale and Red Fork, among others. The Riverparks system, also here on the bank of the river, includes the Riverwest Festival Park, with its floating stage amphitheater overlooking downtown. Riverwest is home to such popular events as Tulsa's Oktoberfest, one of the largest of its kind in North America, and the Gatesway Balloon Festival. Tulsa's westside is also home to The Oaks Country Club, one of Tulsa's three major country clubs, and Inverness Village, a large retirement community. In addition to these companies, Camp Loughridge, a Christian Summer Camp operates on 186 acres of land in West Tulsa. ^ Easterling, Mike. "East Village: Dead or Alive?." March 25, 2009. Accessed September 7, 2011. ^ Krehbiel, Randy. Tulsa World. "3 Tulsa areas added to National Register." December 28, 2010. Retrieved November 21, 2011. ^ "The Church Studio", Oklahoma Tourism & Recreation Department (accessed 2016-12-09). ^ Tulsa Preservation Commission. "Riverview Historic District - Significant Properties." Retrieved December 27, 2011. ^ "What is the history of Cherry Street?" Tulsa City-County Library. Local/Municipal Government. Retrieved November 10, 2014. ^ NRHP Registration Form - McGregor House. United States Department of the Interior. September 17, 2013. Retrieved November 11, 2013. ^ Tulsa Preservation Commission. "Swan Lake Historic District." Retrieved November 20, 2011. ^ Tulsa Preservation Commission Website. "Urban Development (1901 - 1945)." Accessed May 5, 2011. ^ This Land, "The Nightmare of Dreamland." Accessed September 12, 2011. ^ Tulsa Preservation Commission. "North Cheyenne Historic District." Retrieved January 2, 2012. ^ "Braeswood Homeowners Association website, About Braeswood". Retrieved 2017-08-11. ^ "Alsuma: The Town That Disappeared From Southeast Tulsa." Arnett, David. GTR Newspapers. March 30, 2007. Retrieved August 2, 2014.